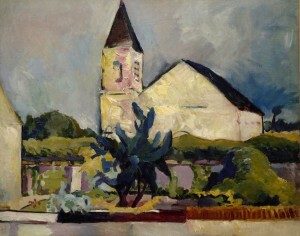 Carles painted The Church during one of his several visits the American artist made between 1907 and 1910 to the small village of Voulangis, situated on the Seine about 25 miles east of Paris. He painted the simple Romanesque church at the heart of the village from the high vantage point of his window at the inn where he lodged. 1 The influence of both Henri Matisse and Paul Cézanne is clear in the color and composition. Carles painted in the Post-Impressionist style, using pure blocks of color and lush impasto strokes. He captured yellow, mauve, and blue in the dull gray walls of the church, and the palette he used for the garden in the lower half of the composition recalls that of Paul Gauguin. Carles was invited to exhibit two oils at the Armory Show in New York—the other is not identified. He also exhibited an unidentified interior scene in the show’s Chicago venue. The works do not seem to have been for sale, as no prices appear in the organizers’ records. Nor do they seem to have captured the critics’ attention, for they don’t appear in any of the reviews. Barbara Ann Boese Wolanin, The Orchestration of Color: The Paintings of Arthur B. Carles (New York: Hollis Taggart Galleries, 2000), 37. “‘True Art Emotional,’ Carles Says,” Philadelphia Press, July 21, 1913, 7. After the Armory Show, Carles became recognized as a spokesman for modern art in the United States. In 1917 he returned to the Pennsylvania Academy of the Fine Arts as a teacher, bringing French and American modernism to young artists and the public through a series of important loan exhibitions he organized there in the 1920s. His later years were marked by bouts of alcohol abuse and in December 1941 he suffered a stroke that left him an invalid until his death in 1952. Barbara Ann Boese Wolanin, The Orchestration of Color: The Paintings of Arthur B. Carles, exh. cat. (New York: Hollis Taggart Galleries, 2000), 34. Carles taught at the Pennsylvania Academy through 1925. Wolanin, 48-50.